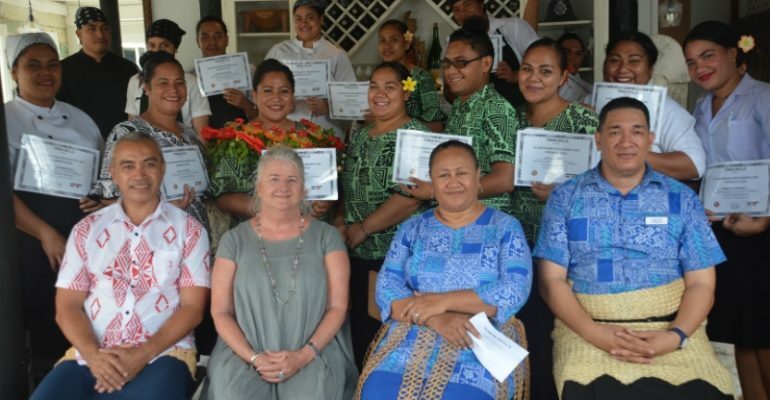 A Deep Dive coaching approach for skills development is being piloted by Tonga Skills as a way to support sustainable business growth across the tourism sector value chain. Tonga Skills congratulates Friends Café & Restaurant located in the central business district as the first to complete a deep dive coaching approach to upskill 21 staff members on customer service delivery. The coaching program is based on a customised coaching manual in accordance with Friends Café’s priority skill needs. It involves a two hour coaching session per staff member each week for 5 weeks which commenced in October 2018. The coaching manual consists of 14 units on various customer service aspects, such as approaches to different types of customers, meeting and greeting, personal appearance, handling customers and complaints, dealing with legal and physical threats, answering telephone techniques, among others. Friends Café’s Managing Director, Mr. Paul Johansson, expressed his appreciation for the partnership with Tonga Skills and the privilege for the staff to take part in this great opportunity because “a business is only as good as its staff”.